The ads I have chosen to analyse for this assignment are chocolate ads. Slogans are central to all of these ads and whether you believe it or not when someone says “How do you eat yours?” “Here today goo tomorrow”, “Probably the crumbliest flakiest chocolate” “Have a break have a KitKat”, “Its not Terry’s its mine” or “quit your jibba jabba fools Mr T is watching” your mind will suddenly flash back to the ad in question. Advertising has clearly become central in the sales of ads with companies paying millions just to get their product out there. Cadburys Wispa “thank you” ad from Now magazine on 13 April 2009. I chose this ad because Cadbury’s have spent so much money on campaigns that I thought this is a good example to use. Even after the excitement of the return of the Wispa has died down this campaign lures the customer in reminds them that the Wispa is back just in case they had forgotten. I will also look at Cadbury’s crème egg, gorilla and airport run way campaigns. I have also chosen both Mars’ “tones less packaging’ ad from Now magazine and Nestle’s “Proudly putting our eggs in one basket” ad from Love it magazine on 6 April 2009 campaign. I will compare both of these to each other as essentially they are trying to get the same message to the consumer. Chocolate sales are highly competitive and the target audience of these are chocolate consumers throughout the world. Google searches of these images brings up varied results from over 39,100 results for Cadbury’s alone to 24,600 for Terry’s chocolate orange. There are several different terms used when describing a product from lighting to composition, addresser to addressee. I will analyse my ads with reference to these and Russian linguist Roman Jakobson’s breakdown of the act of communication. These days however Cadburys take part in million dollar advertising campaigns. The Wispa campaign cost millions to promote and resulted in the return of the Wispa. The ad I choose contained text saying ‘Thank you for storming Glastonbury and thank you for the face book campaign. Thank you for buying it and thank you for living it…. While some may see this as a simple thank you letter it is in fact much more. The addresser (Cadbury) is communicating with the addressee (chocolate consumer and magazine reader) with the aim of this and the message to the addressee is to remind them that the Wispa still exists. Now that the campaigning is over the addresser clearly does not want the addressee to forget the product. With a frame of photos from the campaigns surrounding the text this ad captures the readers attention and holds it for quite a while whilst the reader is looking at each of the photos. Counting over 50 photos in the montage I think this is a good way to capture attention. The angle and distance of this ad is normal: neutral with the picture being a straightforward full on close up view of the ad. There is no straightforward composition of this ad. It is no set up as a photograph. Like many other Cadbury ads it is instead a photo shopped image composition. For this reason dept of field is also irrelevant. All the images used in the border and clear and in focus. It is interesting to look at Cadbury’s recent advertising history as one of the biggest chocolate producers they are constantly working at promoting their product.In August 2007 Cadbury embarked on a £6.2 million campaign. Created and directed by Juan Cabral the aim was to prompt a higher brand engagement from the public and was “founded upon the notion that all communications should be as effortlessly enjoyable as eating the bar itself.” The campaign featured a gorilla beating the drums along to Phil Collins’ “In the air tonight”. The success was followed by a remix featuring Bonny Tyler’s “Total Eclipse of the Heart”. At the same time Cadbury released their “Airport trucks” campaign featuring – Queen’s “Don’t stop me now” which was later replaced by Bon Jovi’s “Livin on a Prayer” .In January 2009 these ads were replaced by the dancing eyebrows campaign. While the above ads were popular this ad has resulted in a backlash of haters across the world leading to comments such as,“I hate those creepy children” and “I’ve seen the ad several times and never realised it was for chocolate”. However according to The Daily Telegraph “The one-minute film for Cadbury’s Dairy Milk chocolate is thought to have been viewed more than four million times on You Tube and similar sites in its first three weeks”. It has twice the number of viewings as the firm’s previous gorilla campaign. This year both Nestle and Mars took advantage of the Easter egg season to launch their new green campaigns. Again with both of these ads both the addresser (Nestle and Mars) and the addressee (consumer) are the same as Cadbury. However the message communicated is different. Both of these ads are trying to communicate the message that their Easter products are eco- friendly. Nestles ad, which features a Smarties Easter egg titled “Same size egg, 25% less packaging, No plastic. Also featuring thumbnail sized logos of Rolo, Aero and Kit Kat eggs the ad suggests that the campaign is right across their line of eggs. The print on the bottom left suggests that the new packaging is “easier to recycle and better for the environment”. With the reassurance that “whilst we have reduced the packaging, we haven’t reduced the chocolate”. In contrast the Mars advertisement was on a simple white back ground with no clutter. Choosing a Mars bar egg as their main image Mars also use thumbnail pictures to represent Malteasers and Snickers eggs. The text used it also simple and kept to the bottom of the page the amount of text used is far less in contrast to the Nestle ad and simple says “We’ve reduced the amount of packaging …by 39%, a total saving of 39 tonnes of plastic and 114 tonnes of cardboard. This text is far more detailed in what exactly they have done. While we learnt that Nestle reduced their packaging by 25% the consumer has no idea what exactly this means for reducing waste. Straight on shots of the products left little room for the consumer to imagine what was going on in the background. The Nestle ad, which is full of colour, can draw the consumer to it whereas the Mars ad focuses in on the actual product. The angles of both ads are neutral and the composition was also normal with no blurred background. Both Easter e.g. boxes were positioned at an angle to give a 3d image. Another difference comes with the angles of the shots. Whereas the Mars ad is shot straight on the Nestle ad is taken from above so as to include the detail on the top of the box also making the box more “life like”. Also the thumbnails in this ad are shaped in the shapes of boxes rather than the straight on shots in the Mars ad which appear just like logos rather than being a the shape of an actual 3d box. There is also a wide dept of field in the Nestle ad with everything being in focus from the logo at the front to the box and the hill. However the background sky is blurred. Dept of field is no relevant in the Mars ad as the background is plain white however a shadow behind the main box image indicates dept in the ad. 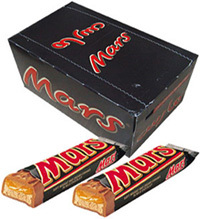 Also using a photo manipulation of the Mars Easter egg the main image taking up the page replacing the words Mars with “Tonnes” and the names on the bars with “less” and “packaging” so there is no way a consumer will miss the message. At the bottom right of the page the slogan “Have a break, Have a KitKat” is used just in case the consumer doesn’t know what the product is. The majority of the page is taken up by images of unwrapped KitKat bars. With two central to the image others are clear in the background. Again the addresser in this ad is Nestle the chocolate company and the addressee is the chocolate consumer who is concerned about their weight. This is indicated by the “have a perfect break at 107 calories” slogan. The shot is a wide-angle shot of KitKat with all the KitKats being in focus. Layers upon layers of stacked KitKats indicated the debt of field. The lighting is low key with a focus on lighting coming from the top right shinning down on the middle KitKat highlighting the upper right hand side of the bar. Terry’s chocolate orange has been become a household name through the Dawn French adverts and her slogans “its not Terrys its mine”. Along the way phrases such as “When you whack a Terry’s Chocolate Orange, Good Things Happen” “tap and unwrap” “It’s not Terry’s, It’s yours”, or “Don’t tap it… Whack him!” have been used. The newest advertisement for Terry’s chocolate orange is filmed in a busy office setting. Titled the “count down advert” the female character cracks open her chocolate orange and when answering her phone she turns around. With her back to the chocolate orange her work colleagues all steal a piece. The slogan “round but not round for long” plays on the description of the round chocolate orange and also the fact that everybody wants some of it and it didn’t even last until the end of her brief phone call. The addresser in this ad is again the chocolate maker and the consumer is the addresser. The message communicated is that the chocolate is so good that everyone wants some and it will not last long. Unlike my above images this ad is not a still image so there is a lot happening. There situation is an office and the camera angle keeps panning around in a circle. The camera angle could in fact be considered to also represent the roundness of the chocolate. The ad circles around the main character in the pink shirt with shots of the chocolate on her desk interrupting this motion every few seconds. As the time moves on these shots show less and less chocolate. A clock is also used to indicate the passing of time whilst fellow office colleagues pop out from all angles of the screen to get the chocolate. The debt of field is mostly focused on the one thing be it the main character, the clock or the chocolate. The lighting is clearly artificial office lighting with florescent bulbs. Introduce yourself to the group and conduct a short icebreaker activity so as to relax the group and get them to know each other. Such activity could be anything from says three things about yourself two true one false and get others in group to guess which is false or else to keep it more focused to chocolate you could split the group into pairs and get them to match a picture of a bar of unwrapped chocolate with the brand logos and see who could finish first. Have each member of the group take a short computerised 10-15 survey. Showing them ads of the chosen chocolate and asking them to recognise the brand and getting them to indicate how they feel about the chocolate. After this have a group discussion on the survey. By this stage all members of the focus group will have been introduced to the products visually. You could perhaps use this practical session as an opportunity to taste the product as a group and discuss this. By doing this and the above you have both confidential computerised data as well as a group opinion. Conclude the meeting and thank everyone for taking part. The purpose of the focus group is to find out how successful the advertising for the product is. For the focus group I would choose a mix of consumers from different parts of the country, different ages, different race and background. Unlike cars chocolate has a very wide target audience so getting a mixed group would give the best possible result of how the average consumer views the product. As I mentioned above I would like to have both a computerised survey as well as a group discussion.For the computerised survey I would ask questions such as those listed in the survey below. For the group survey I would give each group member some chocolate to taste and ask how he or she feel it tastes. This is a good way of getting feedback especially for new products. While we have already gotten the technical details out of the way in the computerised survey this group survey would give the group a chance to relax and feel about the product. Below are some of the questions I would ask. 3. What region do you live in? 4.What is the occupation of the main income earner in your household? 5. How often do you purchase chocolate? 6.Where do you purchase your chocolate? 7.Thinking about the chocolate you buy which of the following brands have you bought in the past month? 9. What brand was the last bar of chocolate you ate? 11. If so how did it make you feel? 12. When thinking about the following factors which brand comes to mind? The above are just some questions that can be asked. The questions give answers, which will provide the researcher with accurate information to base their results on.